How deep is your salmon fly fishing? How deep is your fly? While fishing down a salmon pool, do you have a clear picture of where your fly is and how it is behaving? For my own part, I have to confess that, for much of the time, I have only a vague notion of how deeply my fly is fishing. I might picture my size 8 Cascade double, tied to a twelve foot leader on a floating line, fishing somewhere between four inches and a foot below the surface; or my one inch copper tube on an intermediate line sinking to a depth of two to three feet. But I have never been at all sure. Fly depth will, of course, depend on the line density, leader composition and length, fly size and weight, the strength of the current, the angle of the cast, the manipulation of rod and line and the speed of retrieve. So many variables! Yet getting this vital element right may mean the difference between a fish on the bank and yet another blank day, and I have enough of them. So my resolution for 2015 is to gain more control of the situation, or at least to know more about what is going on at the business end of my line. 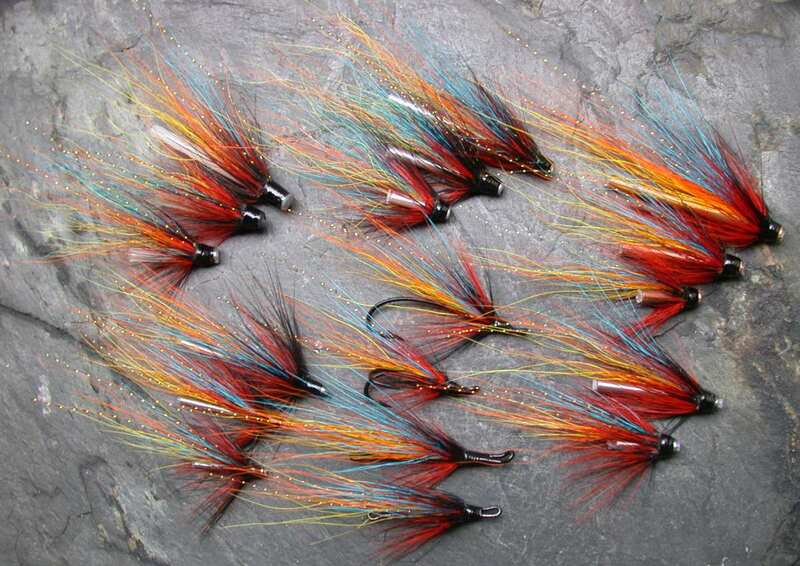 Much has been written, over the years, on the best depth to fish our salmon flies. 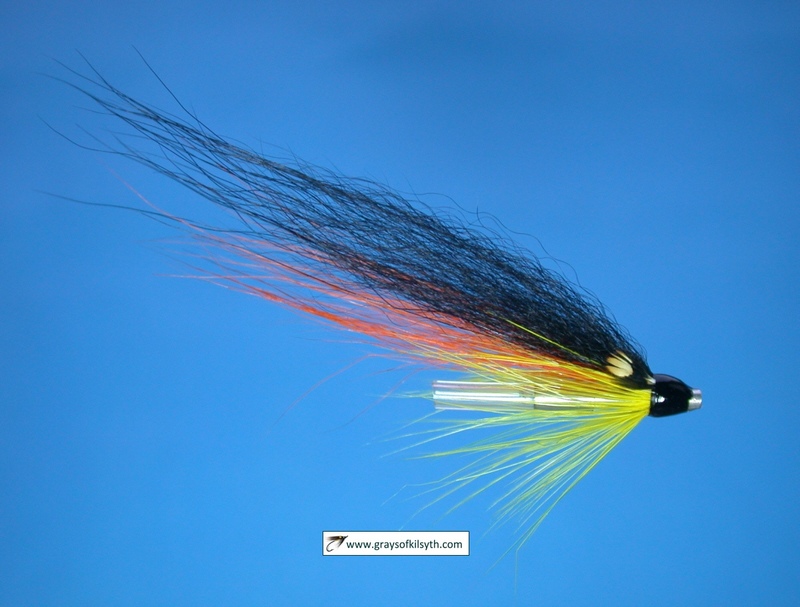 There appears to be fairly widespread agreement that, in the cold waters of early season and again, though perhaps to a lesser extent, in late autumn, we should generally aim to fish our flies deeply, to bounce our flies off the noses of deep lying fish disinclined to expend a lot of energy chasing flies fished several feet above their heads; conversely, when air and water temperatures rise in the summer months, we are advised to fish our flies on or near the surface. 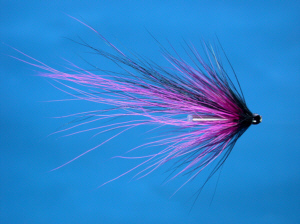 It would not, I think, be unreasonable to assume that there will be times in between when we might profitably fish our flies at various intermediate depths. The best depth, of course, may not be easily fathomed - and might in fact be considered the sixty-four dollar question - but the more control we have over the depth we fish our flies, the better. Indeed, depth and speed might well be even more important, on occasion, than fly pattern. In the early days of salmon fly fishing, the attainment of depth was severely limited by the lines available at the time. A silk line would float for a time if greased and, if left ungreased, would sink slowly but to no great depth. If the angler wanted to fish deeply, he would need to use a heavily weighted fly, dressed on a very large hook or on a heavy copper tube of perhaps three inches in length. 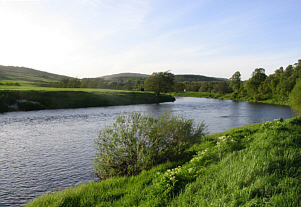 Today's fly fisherman is governed by few such restrictions. Indeed, refinements in fly fishing tackle, in particular in the variety of line densities and profiles now available, combined with a wide assortment of fly hooks and fly tubes in a variety of materials, weights and shapes, allow him to fish at pretty much any depth he chooses, and he can do so with greater ease than ever, assuming that he can make sense of it all in combining rod, line and fly to most effectively achieve the job in hand, no mean task given the seemingly overwhelming choices now forced upon us by modern technology. Get the combination of line and fly right, though, and the rewards can be great. Here is where a bit of time spent in (literally) weighing up the options might be very worthwhile. In the March 2015 issue of Trout & Salmon, modern options on optimum line and leader combinations for varying fly fishing depth were usefully explained in some detail in the article "Which Line for Spring Fishing?" In that same issue, I read with equal interest "The Weighting Game"� by Peter Gathercole, looking at tube and cone selection in the attainment of depth in early season fishing, i.e. the second half of the line/fly equation. While it is important to know which materials and tube/cone combinations are heaviest and which will fish more deeply than others, I found myself asking, "But precisely how deep, for example, will a one inch aluminium tube fly fish compared to a fly dressed on a double hook, and how much more deeply can we expect a one inch copper tube fly, or a tungsten tube fly, to fish?" So I resolved to find out. 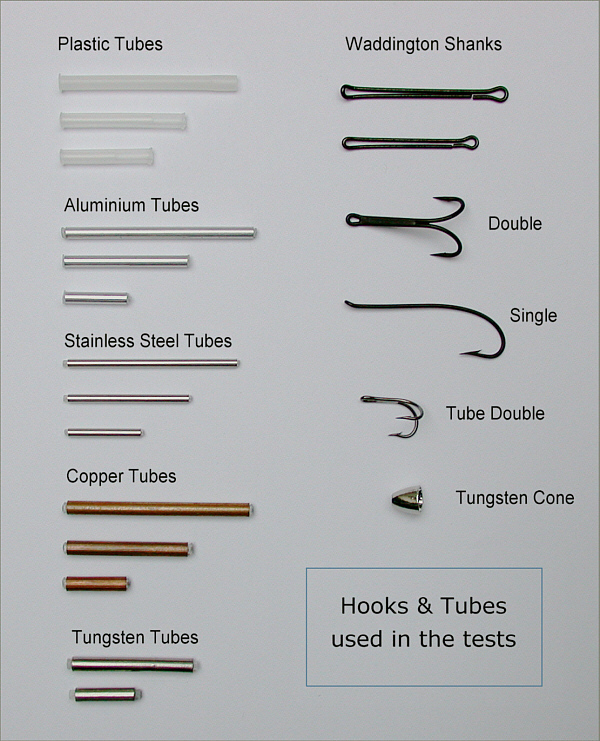 Note: the addition of a steel hook to nylon and aluminium tubes will increase the overall average density of the tube fly, while a hair and feather dressing will decrease the average density of all items. A tube made from a dense material such as tungsten will sink more rapidly than one of equal dimensions made from a less dense material such as aluminium because the downward gravitational force on the tungsten tube will be greater than that on the aluminium tube but the opposing upward buoyant force will be the same in both cases, because both displace the same volume and weight of water. In addition, a denser tube will more readily overcome the lateral force of the river flow in preventing it from sinking. Note that I say "denser"� rather than "heavier"�, for it is not the weight but the density and shape of an object which will determine how quickly or deeply it will sink. This might be easily illustrated by comparing the sink rate of a two gram nylon tube with that of a one gram tungsten tube. Which one would sink faster? So, in line with our table of relative densities, we can expect an aluminium tube to sink more rapidly and fish more deeply in flowing water than a nylon tube, a stainless steel tube to fish more deeply than the aluminium and so on - but precisely how much more deeply? And how would varying the weights and lengths of the tubes affect sink rates and fishing depth? 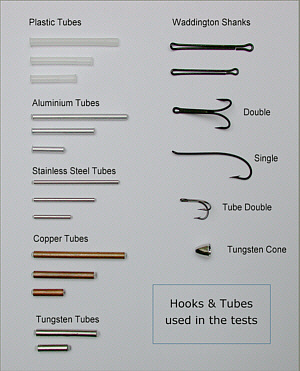 My first step was to gather together a selection of commonly used hooks and tubes in a variety of materials and sizes as shown above right. I first weighed each item. I then added a common, shrimp style dressing to all items (omitting a body dressing for simplicity and ease of identification). On reweighing them, I found that the dressing added 0.1g to the weight of each. It should be noted here that adding a dressing, despite the increased weight, is likely to reduce the sink rate of any hook or tube, because it reduces the overall density, while increasing buoyancy. In addition, the added bulk of the dressing creates greater water resistance on the sinking fly. Hence, a fly with a bulky dressing will tend to sink more slowly than one with a sparse dressing. Waddington shanks and tubes were fitted with size 10 Fulling Mill tube fly doubles during testing, adding a further 0.2 grams to their weights. So how did I then carry out the tests to find out how deeply each fly would fish? I selected a section of the River Spey (The Upper Bend) on the Strathspey Angling Improvement Association water above Grantown, a nice bit of fly water with a steady, even flow (measured on the day running at a level of 1 ft 3 inches above summer level and at a speed of 0.75 metres/sec). I waded into the stream to a depth of three feet and anchored a weight attached to a float. This provided a fixed point from which to carry out the tests. To the float I tied a 10 foot length of floating fly line, connected in turn to a ten foot leader of 12 lb Maxima nylon, to which the test items were tied in turn and the depth at which they each fished measured using a metre stick. I first tested all flies, measuring the fishing depth of each before adding a 1.3 gram tungsten conehead to the front of each and retesting. The results are shown in Table 2 below. 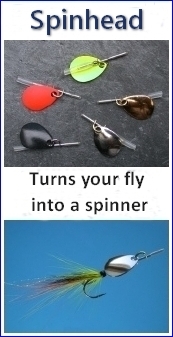 Adding a 1.3 gram tungsten conehead to the front of any of the flies added approximately 25cms to the depth each fished. 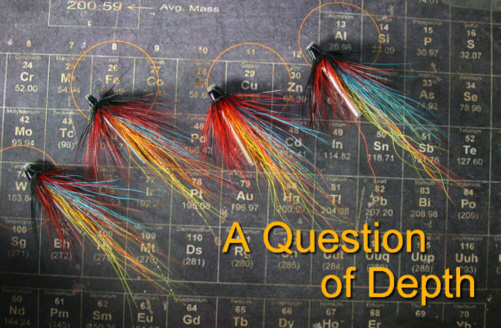 The results show that the depth to which a fly sinks correlates quite closely to the density of the material from which the hook or tube is made (moreso than the weight of the fly). For example, in a moderate current of 0.75 m/sec, a one inch nylon tube (density 1.1), although it weighs 0.45g with a double hook attached, floats; an aluminium tube (density 2.7) struggles to sink; a size 6 single hook (density 7.8) sinks to a depth of 14cms; a one inch stainless steel tube (density 8.0) sinks to a depth of 18 cms; a one inch copper tube (density 8.9) sinks to a depth of 22 cms; and a one inch tungsten tube (density 19.6) sinks to a depth of 50 cms. Note that the copper tube sinks only 4cms more than the stainless steel tube, although it weighs almost twice as much. The stainless steel tubes, although only marginally less dense than the copper tubes, are significantly lighter than the equivalent lengths in copper because they have a smaller diameter (copper - 3mm, stainless steel - 1.8mm). The simplified illustration below, derived from the above Table 2, shows the fishing depths of a selection of flies, dressed on one inch long hooks and tubes of varying density/weight, when fished on a floating line in a moderate flow. From this, we see that it is possible, using a floating line in a moderate current, to fish at depths ranging from 0 (nylon tube) to almost a metre (tungsten tube plus tungsten cone), simply by a change of fly. 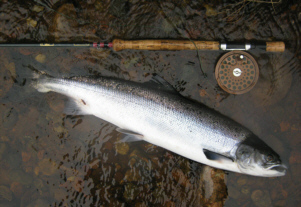 Note that these depths are with the fly on the dangle, fishing directly downstream of the rod. By casting at varying angles, mending and/or retrieving line etc. we can, of course, achieve more or less depth if required. Armed with this information, I feel that I can now predict more accurately how deeply a particular fly will fish and select a fly more confidently to achieve the desired depth. 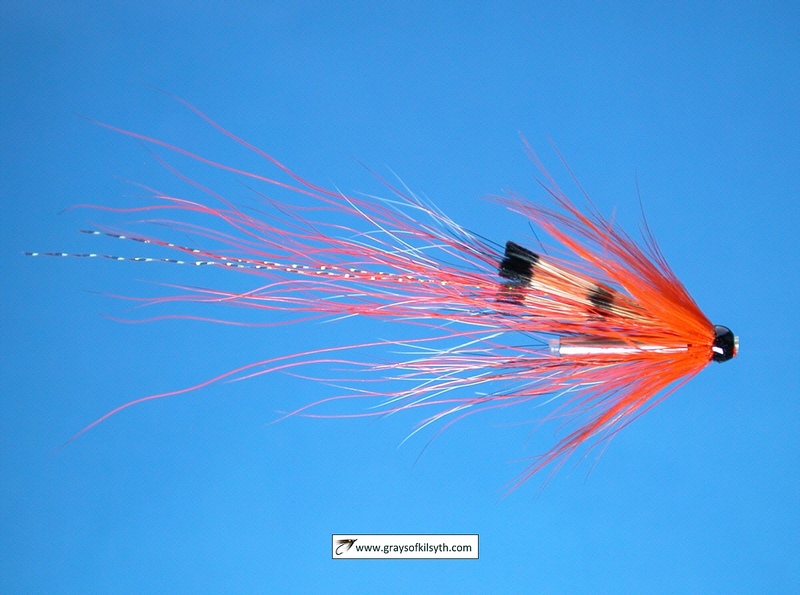 If I add the further permutations made possible by changes in fly line density, the addition of sinking tips etc. I can fish at virtually any depth I like. 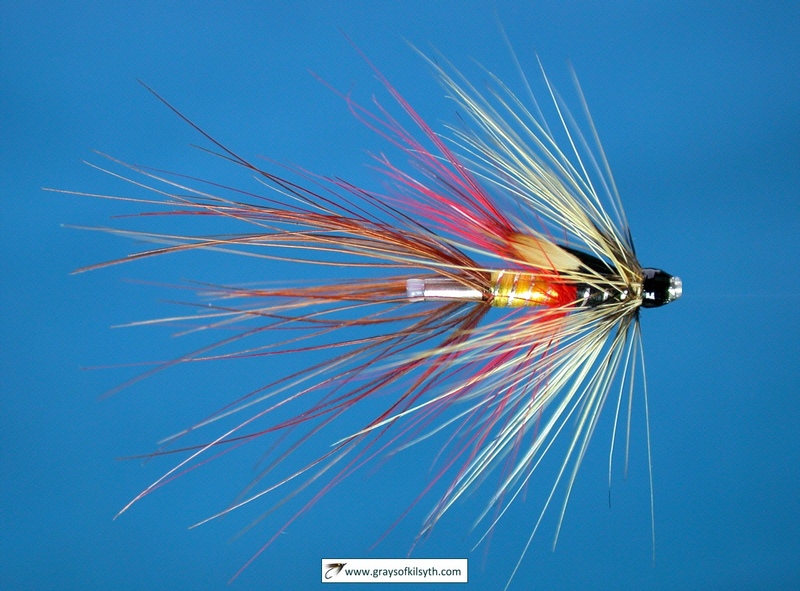 So this season, by careful combination of line and fly, and with a new awareness of relative fly sink rates, I will be in a much better position to control the depth of my fly and to know more precisely how it is behaving. Now I just need someone to tell me what depth is the right one in any given circumstances!